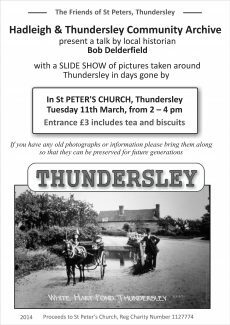 Hadleigh & Thundersley Community Archive has linked with the Friends of St Peter’s to support a slideshow talk by local historian Bob Delderfield. The pictures are of Old Thundersley in days gone by. The entrance contribution of £3 includes tea & biscuits. Proceeds go to St Peter’s Church. There will also be an opportunity to register your interest in getting more information about the archive. 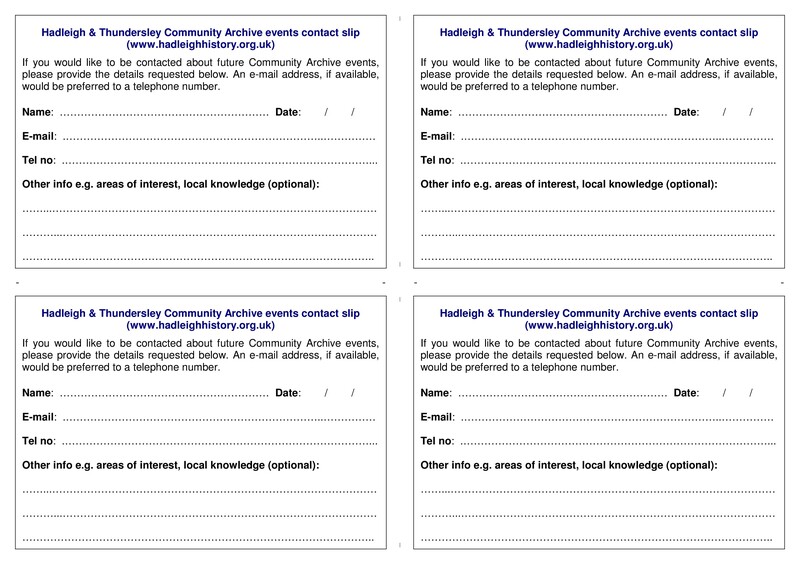 This page features contact forms to print at home and complete at your leisure ready to hand in on the day; similar forms will also be available at St Peter’s and we look forward to seeing you, whether you want to register an interest or not. We can arrange to scan old photos and documents, help you to record these and your memories on the archive, all completely free of charge. This allows your family, friends and future generations around the world to see the pictures, add their memories and build the community’s free, virtual archive. Click on the poster and contact forms for larger versions. A PDF version of the contact form is available below. I would loved to have been at the talk and slide show by Bob Delderfield on 11th March, but I have only just found this web site and read about the event, plus I no longer live in Essex. I wonder if someone can help me, please? Does anyone have a photograph of a flat roof, art deco style, semi detached bungalow called (in 1940’s & 50’s) “Redwing” in Goldfinch Lane on Thundersley Common? I would very much appreciate a copy, if there is one, relatives of mine used to live there. I know that Redwing and its twin semi became one dwelling (probably during the early 60s) and I believe that it was Mrs Ball and her family who lived there. Mrs Ball was a teacher at Thundersley Primary School. She had a daughter called Angela. Part or all of “Redwing” may have been knocked down around that time. I don’t know if any of the original buildings remain now. Hoping someone can help me. Thank you for reading this! I went with The Thundersley U3A Local History Group(1). It was great; we all enjoyed it. Our research has been about Thundersley and we all found it very informative. Thank you, Bob! 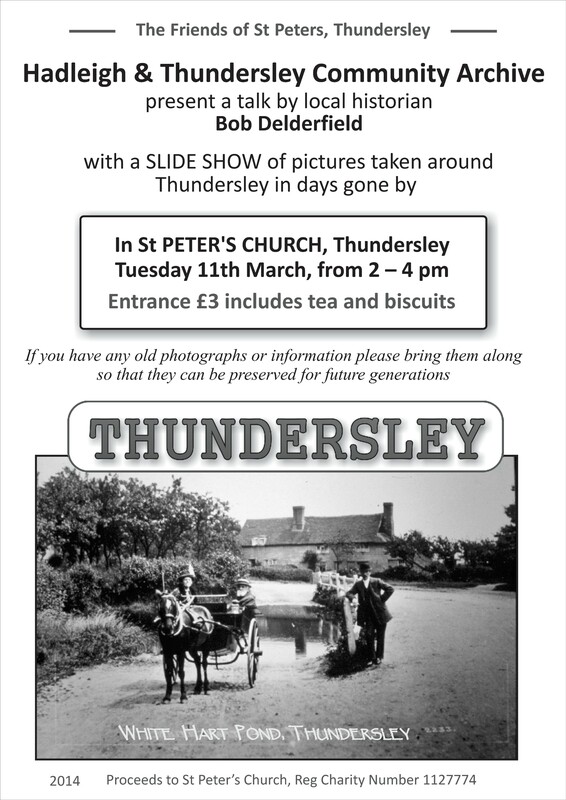 Thank you for a great Thundersley slide show yesterday at St Peter’s Church. What a great turn out of people 🙂 Thanks again Bob. Regards Kenny.